The Appalachian Trail was not the only effort to open up the forests of the American South to a much larger number of visitors during the 1930s. 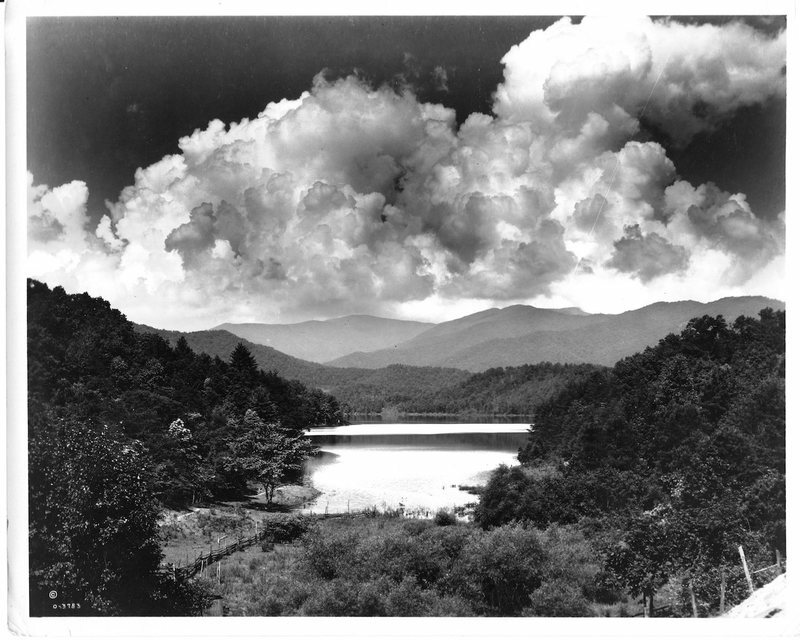 In 1935 the Roosevelt administration commenced work on a scenic highway that would traverse the ridgelines of the Appalachian Mountains from Virginia to Tennessee. 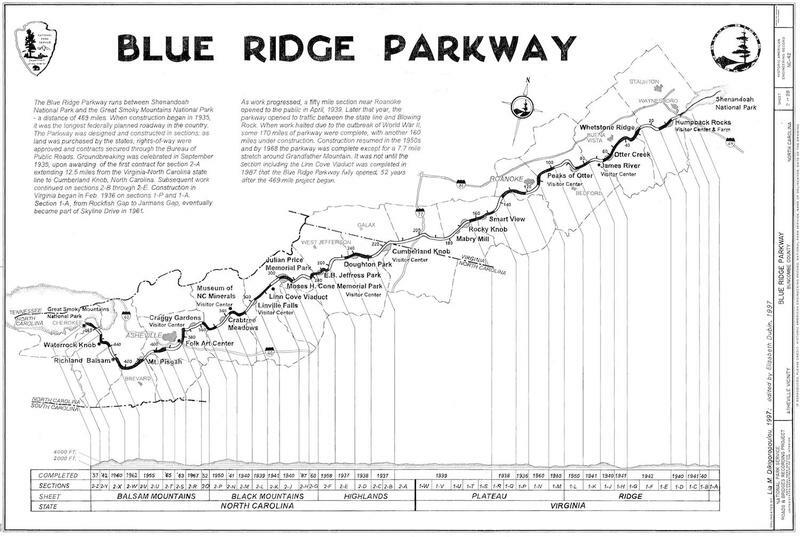 The Blue Ridge Parkway, orginally known as the Appalachian Scenic Highway, posed an immediate challenge to the Appalachain Trail, because much of the route proposed for the new Parkway was across some of the same ridgelines that the AT already traversed. In a number of cases the new road, and its planned extension into Shenandoah National Park (Skyline Drive) would completely obliterate sections of the Trail that the southern clubs had worked so hard to build. Similar proposals were also under consideration for scenic roads in the Presidential Range of New Hampshire and the Green Mountains of Vermont. The question of how to respond to the intrusion of this roadways into the wilderness traversed by the Appalachian Trail came close to breaking the ATC, because it exposed a basic division between those in the Conference like Perkins and Avery who were much more concerned with completing and maintaining the Trail as a recreational resource, and those like MacKaye, who also saw the Trail as first and foremost a recreational resource, but was much more concerned about preserving the wilderness experience for Trail users. 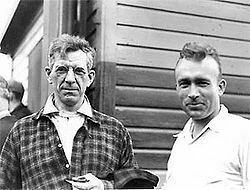 In a 1932 essay in The Scientific Monthly, MacKaye wrote that the "Appalachian Trail indeed is conceived as the backbone of a super reservation and primeval recreation ground covering the length (and width) of the Appalachian Range itself, its ultimate purpose being to extend acquaintance with the scenery and serve as a guide to the understanding of nature." His emphasis on the notion of the "primeval" character of the Trail was emblematic of his belief that the Trail should remain as close to its natural state as possible. By contrast, Avery was driven by the ultimate goal of a completed trail, primeval or not. As federal and state goverment plans for wilderness roadways gathered steam, MacKaye argued strenuously for a modification in the planned roadways that would take them off the mountain crests and move them downslope to what he called "flankline" routes. "This is an issue [that] involves the fate of the Appalachian wilderness as our hinterland of outdoor recreation," he wrote in a 1935 essay in the journal Appalachia. Much to his disappointment, Avery and others within the ATC leadership were more inclined to collaborate with the National Park Service and the National Forest Service if that collaboration meant securing support from these two well-funded agencies (and the Civilian Conservation Corps) for the completion of the Appalachian Trail, even if that meant relocating the Trail to make way for forest roads. The growing dispute within ATC over collaboration or opposition to the federal road building projects came to a head at the 1935 meeting of the Conference in Shenandoah National Park. In his presentation to the assembled ATC members, MacKaye argued, "the Appalachian Trail is a wilderness trail, or it is nothing." Avery responded by convincing the delegates to rewrite the rules of the organization, giving him even more authority over the Trail and making it possible for him to marginalize MacKaye and his supporters. Following this meeting, the two men exchanged a series of increasingly bitter letters and ultimately never spoke again. The issue of roadways impinging on the Appalachian Trail remained a major issue for the ATC and its member clubs throughout the next three decades. At various points, the National Park Service, the National Forest Service, and various state agencies up and down the spine of the Trail proposed new roads either across or alongside the Trail. 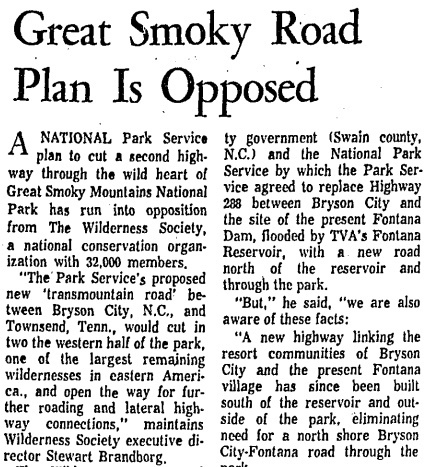 As late as 1968, the ATC, several of the southern trail clubs, and the Wilderness Society (founded by MacKaye and several others) lobbied hard against what was known as the Transmountain Road in the Great Smoky Mountains National Park and were ultimately successful when Secretary of the Interior Stewart Udall canceled the project despite strong support in Congress. Perhaps MacKaye felt some satisfaction in reading in the ATC's newsletter Appalachian Trailway News in January 1968, that the ATC and local clubs' opposition to the prosposed road was to preserve the wilderness character of the park and the area around the Appalachian Trail.